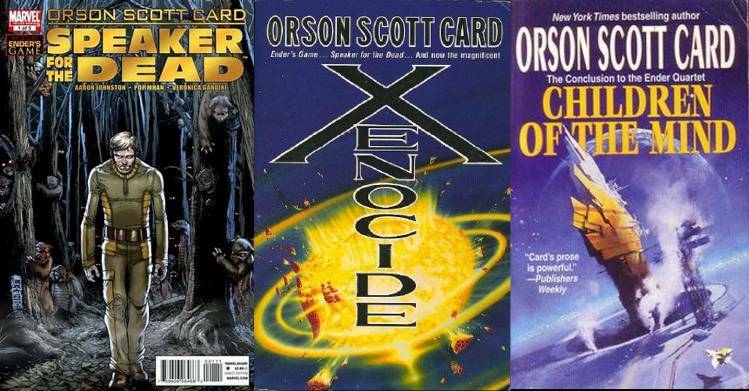 Orson Scott Card is one of the most controversial as well as most perceptive science fiction writers. Many have marveled at how a person who reveals so much sensitivity in his stories, could hold such deep prejudices. He is castigated especially for his opinion against gay marriage and other strong conservative views. But I must say one is seriously missing something if one doesn’t read his stories due to his views. One bemoans the lack of right wing intellectualism – and here he is, and we want to ban him. Understanding conservatism itself is a tricky exercise for it is based on beliefs. So only a true believer can understand how it feels to be a conservative. And this creates a paradox – if you are a believer, how can you have an intellectual, questioning mind that refuses to take anything for granted and challenges everything? If you have such a mind, how do you understand belief which is something you have never experienced. So, a conservative intellectual itself by definition is an oxymoron of sorts. The closest we can come to one is a bipolar person – who fluctuates between intellectualism and beliefs like Han Qing-jao in Xenocide and Children of the Mind and the author himself probably. His first book ‘Ender’s Game’ is a complete thriller and keeps the reader on the edge with the wonderful strategies Ender devises to win every game in the battle school, against other teams, against the video game and finally against the insectoid aliens. From there it branches into 2 series – the tale of Bean, another boy very much like Ender who would have taken on the command if Ender had failed and Ender’s own tale of humanism. The Bean story continues more along the path of strategy and tussle for power, though it gets lot of real world geo-politics wrong – a poorly researched but exciting book with strategies that would have made Sun Tzu proud. But here we will talk about the other series starting with ‘Speaker for the Dead’. Ender after being the architect of the destruction of the alien race, in the first book, is overcome by guilt and seeks redemption. He has found the last surviving hive queen of the alien race and trying to find a home for her. The ‘Speaker for the Dead’ itself is an interesting concept. A speaker for the dead is called to the service of a dead person. He researches the life of deceased person at the insistence of his family and makes a final speech on behalf of the person presenting a holistic view of his or her life including both good and evil. The idea is to accept and understand a person as they really were in their entirety and giving them closure. This is an interesting idea as against the traditional idea of talking only good about a dead person. Because if one just talks the good, one is not talking of the dead person at all. It is just falsehood attributed to the name of the person. Is a person just the name and the skeleton left behind after death? Isn’t a real person the sum total of all their actions in their life? While doing his rounds from planet to planet on death speaking assignements, he encounters this alien race of Pequeninos. They are a strange race with a very strange custom which are closely linked to their complex life cycle. The two humans who are closest to these alien beings get killed mysteriously in a brutal manner by the otherwise friendly seeming Pequeninos. So one line of thread is the mystery of their behavior and that holds the reader riveted. The Pequeninos are one of the best alien races I have read and so different from the typical alien races that are mostly human like beings evolved from reptiles, cats etc. instead of humans. When we finally discover their entire life cycle it is just so mind blowing. There is also this intelligent virus which is deadly to humans and a sentient artificial intelligence who play a major role in this series consisting of 3 books – ‘Speaker for the Dead’, ‘Xenocide’ and ‘Children of the Mind’. This story dwells into the roots of conservatism and xenophobia and provides an empathic understanding of the same. Ender, who was instrumental in destruction of the first alien race humans encountered wants to atone for his heinous act through restoration of that destroyed species and protecting the second alien species they encountered. The idea of a fourth sentient being, a computer intelligence is also a very fascinating premise. The ending of the series in children of the mind though is disappointing. There are flashes of brilliance all over but ending somehow leaves one unsatisfied. I felt it is a random jack out of the box kind of ending. Generally Card is not great with endings. But a book is not just the ending and this series definitely deserves a read for the various ideas both science fiction ones as well as social ones. I definitely feel any SF buff who doesn’t have ideological qualms about supporting this author should read this series. I understand the strong feelings for causes and people don’t want to put money and influence into the hands of a person who is likely to use the same to undermine a cause they are passionate about. But that aside, independently the books are fascinating have some really fascinating ideas. As one article said, these books bring out the very values of understanding, empathy, acceptance and mutual cooperation that his views as a person do not.